Goods classification and origin determination of goods are closely interlinked. Typically, the requirements for determining origin are specified for individual products or product categories identified according to their respective Harmonized System (HS) code. Classification of goods is, therefore, of the utmost importance in establishing which Rules of Origin (RoO) apply to a good. Moreover, in many cases, the RoO to be applied will refer to a change in tariff classification (CTC) at chapter, heading or subheading level, a criterion which requires correct classification of the final manufactured product and the input materials used in its production. It is, therefore, logical that any update of a goods nomenclature should be accompanied by an update of the RoO. Ensuring consistency in the structure of the HS and RoO would prevent misapplication of RoO, facilitate origin determination, and allow Customs to enhance their risk assessment and management of origin, thereby helping to ensure accurate revenue collection. Still, in some countries, as a consequence of HS amendments, different editions of the HS are used for the purposes of HS classification and origin determination respectively, making the determination of origin complicated and time-consuming. If the latest edition of the HS is applied for HS classification while an older edition is used for origin determination, goods would then have to be classified twice – using the latest edition of the HS for classification purposes, and the older edition for origin determination. The issue is particularly relevant and critical for free trade agreements (FTAs). Following an HS amendment, a product may not fall within the range of subheadings indicated in an FTA text as being eligible for preferential tariff treatment, or might fall under a new updated origin criterion. The process can also impact on existing CTC rules which means that HS-based CTC rules must also be updated. According to a study conducted by the WCO Secretariat, on average, 73% of the RoO contained in the 20 largest FTAs are CTC-based rules. Moreover, in more than half of the FTAs, the proportion exceeds 95% (see “Study on the Use of CTC-based Rules in Preferential Rules of Origin”, February 2015). 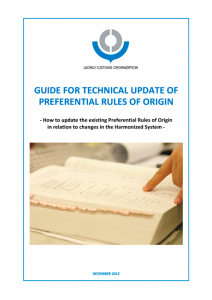 To assist WCO Members with the updating of their existing RoO in relation to changes in the HS, the WCO recently issued a ‘Guide for the Technical Update of Preferential Rules of Origin.’ In the framework of the revision of RoO laid out in an FTA, the Guide will enable time to be saved, and avoid problems that usually arise when amending such rules. Given that the technical update of RoO requires detailed information on the related HS amendment as well as knowledge of the HS, it is highly recommended that this exercise be carried out in administrations at the same time as their preparations for implementing the new edition of the HS, preferably with the assistance of officials responsible for the HS. As Customs administrations around the world are preparing themselves for the implementation of the new edition of the HS in January 2017, the Guide could not have come at a better time.